This sensor module has an MG-811 onboard as the sensor component. There is an onboard signal conditioning circuit for amplifying output signal and an onboard heating circuit for heating the sensor. The MG-811 is highly sensitive to CO2 and less sensitive to alcohol and CO. It could be used in air quality control, ferment process, in-door air monitoring application. The output voltage of the module falls as the concentration of the CO2 increases. 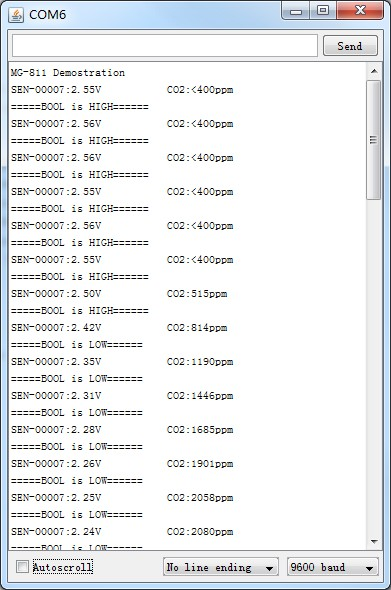 Demo output when a small amount of breath is puffed to the sensor. Very happy with this purchase and with Sandbox Electronics. Great customer service.